We were invited to a rainbow birthday party so I had to come up with a bit of a different card. Here is my beautiful rainbow card. It’s a very simple card. Only one layer, 2 stamp sets, and a few Stampin’ Write Markers. 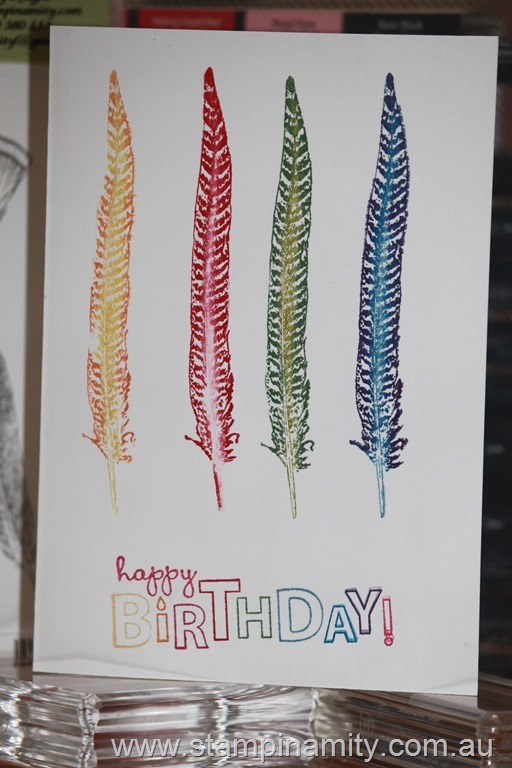 Last month one of the ladies who attended my retreat created a card from the Fine Feathers set to give to me to say thank you for running a wonderful retreat (I was so touched. It was such a lovely thing to do. Why don’t more people do things like that?) She inspired me to purchase the set for myself. I have always wanted the Fine Feathers set but was unsure how much use I would get out of it. Well I can see a similar card coming up for my Stamp-a-stack on the 25th of April. Isn’t it just such a beautiful card?